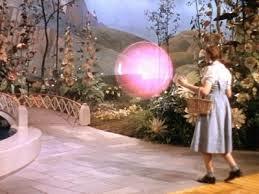 The window in the nursery blows in, just like Dorothy’s bedroom window that blows inward and hits her head. The curtain flaps. That is cue for real world to fade away and children to be transported to Neverland/OZ/ weirdness. See Empire of the Sun, Catch Me if You Can, Twilight Zone the Movie Kick the can Episode, Joe Vs. the Volcano for other gusts that will shift the main characters onto new courses. There is a brief shot of Hook’s curly mustache twitching, twitching… very akin to the guard’s twitching curly mustache at Emerald City’s—hmmm—or was it the Wizard’s gate? At one point, Peter’s daughter breaks into what is meant to be an achingly sweet song like Judy Garland’s Somewhere over Rainbow. Symbolic of innocence, purity yearning for goodness in an imperfect, even bad world. See Empire of the Sun. Tinkerbelle travels about in a bubble much like Glinda’s. Happy ending—they come home to Mommy. See Empire of the Sun, A.I., Sugarland Express, Hook, Saving Private Ryan, War of the Worlds, Close Encounters, Catch me if You Can, The Color Purple, Poltergeist, Jurassic Park (to Grampa) and WOO (to Auntie Em) for other reunions. There may be lots more moments if you can bear watching for them. This is my least favorite Spielberg film. Positively tedious. YAWN.